Web News System: They sold everything and bought a boat to sail the world. It sank on day two. They sold everything and bought a boat to sail the world. It sank on day two. MADEIRA BEACH — Tanner Broadwell and Nikki Walsh dreamed the same dream: Give up the rat race, go live on a sailboat, see the Caribbean, maybe the world. They sold everything they owned in Colorado. Last year they bought a 28-foot sailboat in Alabama and headed for Tarpon Springs. They lived at the marina for months, getting the Lagniappe ready for their journey. They said their goodbyes on Tuesday and set sail for Key West. The next day, the dream died in John’s Pass. The Lagniappe sank Wednesday night while sailing into this fishing village-turned-tourist stop. Their former home sits capsized, within sight of the bars and restaurants. Their belongings floated off to who knows where. 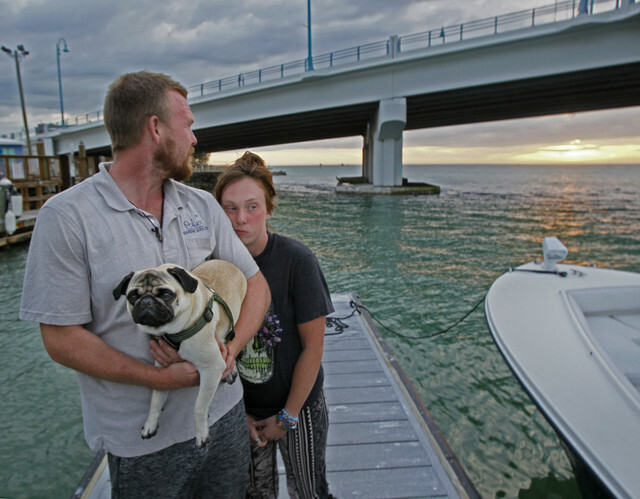 Before they abandoned ship, Walsh grabbed their social security cards, some cash, his ID and her phone — and Remy, their 2-year-old Pug. They have no jobs, no savings and nowhere to go. "How do I have everything," Walsh said, "and end up in a s----- hotel with nothing?" Walsh, 24, grew up in Philadelphia. She dreamed of living in a highrise. Then she met Broadwell. The 26-year-old was from Cocoa Beach with a knack for selling. Their boss flew him to Philadelphia. They were friends at first, then they became more. He was sent to Breckinridge, Colo., to market timeshares. "We got so tired of that lifestyle," he said, "of doing things to make people do the things they don’t want to do." So they started saving their money. He Ubered. They spent two years planning, and then finally did it. They sold everything they owned, even his sport-utility vehicle. In April they bought a 1969 Columbia sailboat in Alabama for $5,000, then spent that much fixing the 49-year-old boat. They named it the Lagniappe (pronounced lanny-yap), Creole for bonus. "Like the 13th donut in a dozen," Broadwell said. "It’s something extra for you." They had no sailing experience. His father helped them sail along the Gulf Coast, from Alabama to Panama City. That’s how the couple learned how to sail. They reached Tarpon Springs in May. They docked at Mar Marina, where Broadwell got a job. They worked on the hull, rewired the boat and got it ready for their journey. "We met a bunch of good people," he said. "Everybody gave us a nice farewell off the docks." They set sail Tuesday, anchoring off Anclote Key. The next day they passed by Clearwater Beach and made their way to John’s Pass to dock for the night. It was about 8:45 p.m. when they sailed into a new port, navigating a channel they had never sailed before, in the dark, fog rolling in. Broadwell steered while Walsh stood at the bow, lighting their path with a spotlight, trying to figure out the navigational buoys. But the red and green buoys seemed out of place, they said, and the shoal wasn’t where their 2016-17 navigational charts said it should be. Had Hurricane Irma altered the channel? Then it happened: The Lagniappe struck something underwater. Walsh almost flew off the deck. Waves rolled the sailboat. It dipped from side-to-side, almost going under. Broadwell realized the keel had been ripped off the bottom. Water started to leak into the cabin. They put their life jackets on (Remy, too.) Walsh dialed Sea Tow, the AAA of the marine world. "My hands are shaking," she said. "I know I probably sounded like a crazy person to them. I’m stuttering trying to talk to them. "They said they would be there in 40 minutes. I thought ‘That is a long time to spend out here.’"
Walsh ran into the flooded cabin and grabbed what little she could. The crash had thrown their things onto the floor. Now their stuff was floating. "I’m just standing there in awe," she said. "I just lost everything I ever owned. I see my things floating away and I can’t get to them." Abandon ship. The couple had to jump into the water. "I think you could sense our tragedy," Broadwell said. "I sold everything I had to do this, and I lost everything in a matter of 20 minutes." The rest of the night is a blur. Stranded on the side of the road with no help, some cash and no credit cards. Broadwell’s mother found them an Uber driver kind enough to spend hours helping them find a cheap motel room. Thursday morning, the cavalry started arriving. "People came out of nowhere," Walsh said. "Everyone just started showing up to help us." Their new friends in Tarpon Springs drove down to help. Broadwell’s mother arrived from Jacksonville. They had no insurance. Nor will the Lagniappe ever sail again. It’s blue hull sticks out of the water in low tide. In fact, the Coast Guard told the couple they need to get their boat out of there. It could cost up to $10,000 to remove and store it. They have about $90. They lost everything save for the shirts on their backs — well, one shirt. Broadwell wasn’t wearing a shirt when he jumped ship. "I woke up today and I was like ‘I don’t have that,’" he said Friday, "or anything I had." They’re relying on family and friends right now to get by. They just got some new clothes and shoes from Walmart. They have no idea how they’ll pay to remove their boat, or even where they’ll live. Broadwell said they didn’t have much to begin with. "Why do you think we wanted to live on a boat?" They might stay with his mother, then float around the state looking for work. They’re still figuring it out. But they’re still alive, and so is the dream. "I’m not going to give up now," Broadwell said. "I’m going to get another boat down the road." "We can’t just give up on our dreams," Walsh said.